Note: Todd, as many of you know, is recovering from a very serious health incident and couldn’t make the trip. So John will be recording the minutes from this meeting. Todd very much wishes he could be here and sent a note to that effect. Mary announces that she will appoint a new second VP to complete Todd’s term. Anyone interested should she Mary before closing meeting. Mary begins conversation about a potential bylaw change for a VP to return to office if a term is first cut short by employment layoff — as no fault of the VP in question — and then that VP gets a new position leading a sports section/department. So excited to be here in St. Petersburg. First, I’d like to thank The Poynter Institute, our host for judging this year. They’ve opened up their facility to us, and it’s just going to be great. Membership down 491 to 405. Primary down from 275 to 232. June 22-25 Charlotte, N.C. $179 a night. Moving on to committee reports. I’ve asked each chair to briefly share an update. Commissioners (Jeff Rosen): Commissioners’ meeting Apr. 21-22 in New York. Usual sports organizations expected to attend, still waiting for NFL conformation. Jeff will send out emails and requests for editors to commit to program. Diversity (Jorge Rojas): Everyone met the Fellows. Funding for program off to a decent start. Everyone is free to donate as much as they want. The Knight Foundation wants us to apply for a grant. Looking for someone to take Jorge’s place as APSE representative at NABJ. Jorge is also working on a standard practice hiring guide. Phil Kaplan reported that there was no Hampton Day this year, but there will still be two $3,000 scholarships available. This year an intern will work for Tim Stephens at Sportsmanias and Ray Stein at the Columbus Dispatch. If you are interested in an intern for 2017, see Phil. Legal affairs (Gerry Ahern): Gerry and John Cherwa continue to work with credentialing issues. There will continue to be an APSE liaison during the NCAA Tournament, and they are working with U.S. Basketball to make sure everyone has a seat. Olympics (Jerry Micco): … As many of you know, Jerry has a new role at the Post-Gazette, so we’re in need of a new Olympics chair. If you’re interested, please come talk to me. Final Olympic housing payment due Mon. Feb. 29. If anyone is having trouble with credentialing, see Jerry. While the search for a new Olympic Committee chair goes on, Jerry is happy to serve in an interim capacity and help where needed. Outreach (Phil Kaplan): Organization Facebook page is great, lots of sharing of jobs and questions. Twitter, hitting 13,700 followers, but concerned we may lose some if we fill people’s timelines with section fronts. Possible could schedule for those updates to be done in off hours of morning. Sports Illustrated would like to house all sports fronts. Contacted APSE to see if that is possible. 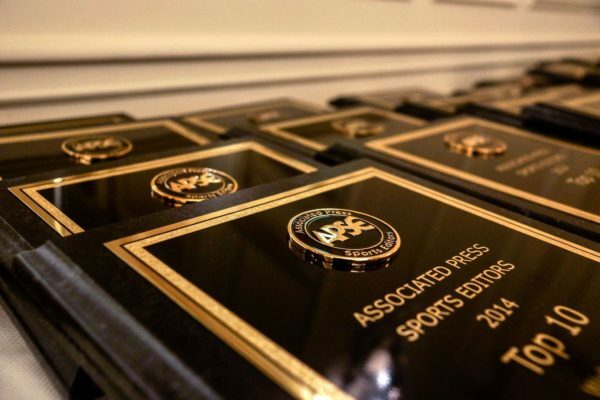 When posting news or awards to Twitter, tag APSE @APSE_sportsmedia. Red Smith Award (Joe Sullivan): Nominations for 2016 Red Smith Award have closed. Ballots were emailed and are due back by March 4. March 7 we should have a winner. Contact Joe if you did not get your ballot. Writers committee (James Crepea): Any ideas how to get writers interested, let James know. He’s the guy moving forward. Getting committee active a little more difficult than expected. Would have loved to have more writers for winter judging because having a writer’s voice during judging is valuable. Outreach is biggest challenge, goal to have more writers in Charlotte for summer convention. Website: Offers out to developers. Website remains a top priority. Proposals from three different developers, including one who is only 17-years-old. Also want to develop an App for summer conference that would replace printed convention schedule. IU business: There has been a lot of discussion where to associate ourselves in the future. We are open to associating with multiple schools across the country including Georgia, Montclair State, Northwestern, Penn State, Maryland and others. This is not to say that the organization is going away from Indiana, we just want to include more people. That being said, the future of the Red Smith Hall of Fame at IUPUI is still to be determined. Jerry Micco suggests the organization should reach out to our current student chapters and utilize them for possible events. Tommy Deas reported that the Southeast Region meeting will be held at our UAB student chapter April 11. Mike Sherman said the IU relationship has been a figment of our imagination and applaudes the officers for making changes. Mary Byrne said one big reason to amend IU relationship is to gain complete control of our organization’s website and intellectual property. Slate nominated for 3rd VP — Justin Pelletier, Lewiston Sun Journal /Dana Sulonen, Opelika-Auburn News/Emily Horos, Aberdeen American News . Additional nominations can be made at the closing business meeting. Will need nominations for both 1st and 2nd VP. Already eligible are John Bednarowski, plus any region chairs finishing their terms — Ed Guzman, Jim Lutrell, Mike Peters and Loren Nelson. So please be thinking about this and we’ll finalize this at the closing meeting. CONTEST — Tommy Deas offers thanks to Mary Byrne, Mike Sherman and John Bednarowski for help getting contest prepared. Tommy, Mary and Phil will be in contest central. Tommy encourages everyone to start their judging work by 8 a.m., as there is much to do and not as many judges or time as usual to get work done. Writing categories will have top 10 winners. Video and multimedia will have either top-3, top-5 or top-10 winners based on the amount of entries in each category. Sections entries are down this year. There will be a top-10 selected in each category with up to five honorable mentions. No writing top-10 results will be posted until the final judging of that category is completed. Tommy will be rewriting instructions on how to prepare entries to clarify process. Todd Adams and Larry Graham were the leads on the 2016 digital contest. Tommy said the interim second VP will take over and get contest started. Reuben Luna motioned to adjourn meeting, Tommy Deas second.